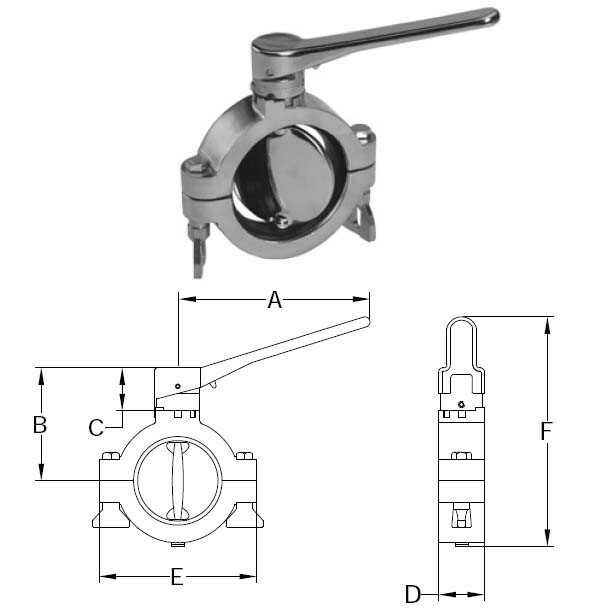 # SANB5102E400-A - Clamp Butterfly Valves - 316L Stainless Steel with EPDM Seal - 4 in. Dimensions: A: 5.6 B: 4.1 C: 1.3 D: 1.3 E: 6.4 F: 8.2 - Break Torque (inch lbs. ): 995 - PSI: 70 - Valve is only 1-3/8" wide on all sizes. Valve uses only 3/4" of line space. The grooved clamp housing connects directly to any sanitary clamp style fitting. Easy assembly uses a hex key for the handle and wing nuts to secure and seal the housing onto your lines. Actuation available: double acting, spring return and electric.